T R A C E S T O N O W H E R E explores themes of isolation and the artist’s search for connection and points of anchor within her environment. The title draws from the first episode of David Lynch’s cult classic Twin Peaks. A combination of the need for solitude with the desire for contact and support manifests itself in constant movement, from place to place, experience to experience, leading the dancer into a state of uneasiness, uncertainty and disorientation. Followed by Q&A with choreographer and dance artist Magdalena Hylak. Magdalena Hylak is a Clifden based dancer and choreographer. She studied cultural studies, including theatre and dance, at University of Wroclaw, Poland. She has worked with many companies and choreographers including Fabulous Beast Dance Company (Irl), Liz Roche (Irl) and Lea Anderson (Uk) as part of Step Up Dance Project; Ciotóg (Irl), Catherine Young Dance (Irl) and Jacek Gębura (Pl) amongst others. 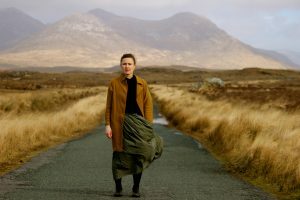 Her dance productions were shown during Dublin Dance Festival, Galway Culture Night and commissioned by both Galway Dance Days and Clifden Arts Festival. Her work ‘Two Years Later’ was shown in Italy with the support of Culture Ireland and Galway Dance Project. Screening directed by Bernadette Divilly. Evolved in collaboration with NUI Galway Arts Office and Múscailt Arts Festival. Dancers: Elodie Rein, Doireann Carney and Maeve Gallagher. Videographer Maria Gibbons. It explores the place, power and presence of women at NUI Galway. The screening will be part of a short talk by director/choreographer Bernadette Divilly. Bernadette Divilly is a Choreographer, Dance Movement Therapist & Dancer with an MA in Somatic Psychology & Dance Movement Therapy from Naropa University Boulder CO and Hons BA in Psychology from NUI Galway. She has an extensive background in Health Education and Community Dance. Specialisations include: Socially Engaged Choreography, Contemplative Dance, Dance Movement Therapy, Somatic Psychology, Humanistic Integrative Psychotherapy and Urban Design. The event will conclude with a short panel discussion on the topic of Dance, Place and Cultural Navigations, moderated by Galway based Dance-Artist, Patricia Glynn. Events are free but booking is essential, as places are extremely limited. Please book with Galway City Museum.